Tonight’s first presidential debate is expected to draw Super-Bowl-sized ratings, but here’s what you should be looking for. The match-up between former secretary of state Hillary Clinton and businessman Donald Trump tonight at Hofstra University in New York is projected to draw more than 100 million total viewers – shattering records. For context, Monday Night Football, which the debate is up against, averaged 12.9 million viewers last season. This year’s Super Bowl 50 drew nearly 112 million viewers while last year’s Super Bowl beat that with 114 million viewers – perhaps because of our beloved Quarterback Tom Brady (In full disclosure, I am a New England Patriots fan). Meanwhile, in 2012 the first two presidential debates between President Barack Obama and Mitt Romney averaged 66.4 million. Television changed the debate game, allowing voters to not just listen to the responses of candidates, but to observe their body language as well as how they communicate their emotions. All of these factors will play into who delivers the best performance. 1. Emotional Quotient (EQ) trumping Intellectual Quotient (IQ) – Psychology Today defines EQ as the ability to identify and manage one's own emotions and the emotions of others. It includes emotional awareness (the ability to identify your own emotions and those of others), the ability to harness emotions and apply them to tasks like thinking and problems solving, and the ability to manage emotions, including the ability to regulate your own emotions, and the ability to cheer up or calm down another person. In the fight between head and heart, strong EQ will leave a better impression than IQ alone. For example, in 1992, Bill Clinton masterfully tapped into his EQ in answering a question that President George H.W. Bush unsuccessfully tried to answer about how the national debt (although the questioner probably meant recession) specifically affected his life. Bush stumbled to answer and admitted he didn’t understand the question. Clinton demonstrated empathy with the struggles of the questioner, while providing his experience as governor and how that positioned him as man of the people. Clinton related with the woman who asked the question and with the audience, while Bush, who meant well, came across as disconnected. Too much emotion can be a stumbling though. Debaters can allow their emotions to get the best of them and lose their cool, even without raising their voices. In 2008 during a Democratic primary debate, Hillary Clinton feigned sadness over not being “liked” enough in comparison with rival Barack Obama. But it was Obama, who came across as arrogant and condescending, when he quipped that she was “likeable enough.” He wasn’t irate, but viewers could sense his irritation with her and it showed a side of him that voters had never seen. But we know he ultimately overcame the stumble! If the candidates fail at the task of managing their emotions, they risk coming across as un-presidential. 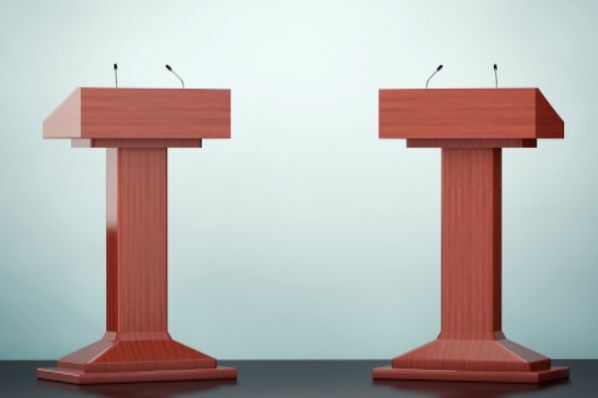 Body-language, physical attributes, and personal delivery all create an impression that confirms –or possibly changes- the way Americans view the debaters. In the past, stature carried a lot weight, but it’s not just about being tall, slim, and broad-shouldered anymore. Posture, hand gestures, and eye rolling all get magnified on camera. They convey what the words rolling off their lips are trying to hide. Just ask President Bush Sr. who looked down at his watch during his debate with Bill Clinton leading to the impression that he was bored. It didn’t help that he did it just prior to a question from woman asking about the hardships of the recession in his life (see #1). Part of coming across as presidential is being able to demonstrate certainty and confidence in what you’re saying. Nothing is worse than forgetting a thought and not being able to recover it. Just as Texas Senator Rick Perry, who back in 2011, forgot the third federal agency he would dismantle if he won the presidency: “I will tell you: It's three agencies of government, when I get there, that are gone: Commerce, Education and the -- what's the third one there? Let's see. ... OK. So Commerce, Education and the -- ... The third agency of government I would -- I would do away with the Education, the ... Commerce and -- let's see -- I can't. The third one, I can't. Sorry. Oops." This episode did nothing to change the impression people had of him. Not looking or sounding presidential may not mean the election is over though, because you might be able to boost your case with ideas, but it helps to come across as caring and competent. (3) Policy Positions or Substance on the Issues. This is what most pundits, economists, and Washington elites will spend their time analyzing: the solutions. The American people want solutions to stubborn long-term unemployment, the economy overall, national security, Social Security, ObamaCare and rising health care costs, criminal justice, and the host of other serious issues facing our nation. In every poll, a solid two-thirds of Americans say the country is headed in the wrong direction. The two people seeking the highest office have a chance to explain how they can lead the country in what they view as the right direction. That is, if they don’t squander the opportunity. So far this election cycle has been heavy on discussions of EQ and looking “presidential” without sufficient emphasis on policies. Americans are hungry for answers, even if only 7 percent are still undecided. The question is whether their appetites of answers will be satisfied. If past presidential debates teach us anything, it’s that candidates have to play to the camera and at the same time seem authentic, while balancing competence and empathy. Being book smart and not emotionally smart won’t win over viewers and neither will being good entertainment without substance.